Sepia tone action photograph of the second race of the 1st Div. 2.18 Bar Trot at Narragansett Park on the Gorham Fair Grounds, Wewdnesday, July 3, 1940. Brown stallion Just Pete (far right) wearing head number two crosses the finish line in first place, putting a time of 2.15 on the board. 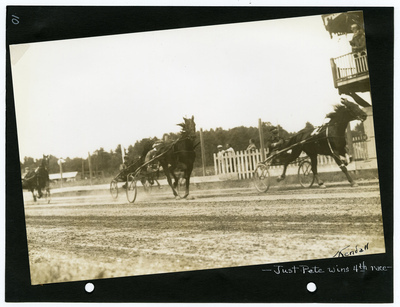 Brown mare Louise Scott (center), Phalen up, finished the heat in second place. The photograph is signed in the lower right hand corner by photographer Guy Kendall.